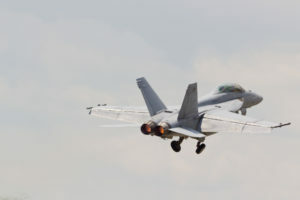 HERNDON, Va., April 8, 2019 /PRNewswire/ — Peraton was awarded a one-year contract extension for the CF-18 Avionics Optimized Weapon System Support program valued at $30M to continue its support for the CF-18 fighter fleet. As the sole prime providing maintenance, engineering, and materiel support services for the entire CF-18 avionics suite and associated support equipment, Peraton delivers high-value supply chain management, automated test equipment engineering support, maintenance and repair, and proactive obsolescence management to maximize fleet availability. The Peraton team has received multiple accreditations from the Royal Canadian Air Force (RCAF) Technical Airworthiness Authority and is the first in Canada to achieve Acceptable Materiel Support Organization (AMSO) accreditation. Peraton’s 76,000-plus-square-foot Calgary headquarters features warehousing capabilities, state-of-the-art training facilities, and dedicated engineering labs for the design and development of test protocols enabling efficient maintenance and repair on assets essential to safeguarding Canada’s sovereignty. With its development of a platform-agnostic, scalable sustainment model applicable to optimizing program performance across air, land, or sea – the Peraton model heralds the next generation of cooperative military advancement. Peraton provides innovative, reliable solutions to the nation’s most sensitive and mission-critical programs and systems. As a trusted provider of highly differentiated space, intelligence, cyber, defense, homeland security, and communications capabilities, Peraton is a critical partner to the Intelligence Community, Department of Defense, and select federal agencies and commercial entities. Headquartered in Herndon, Virginia, the company employs more than 3,000 people across the U.S. and Canada.